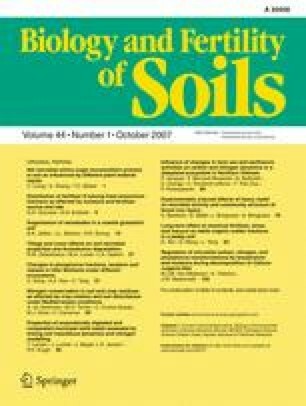 We investigated conservation and cycling of N under oat–oat and lupine–oat rotations in disturbed and undisturbed soil, when roots or roots plus aboveground residues were retained. Crop residues were labelled with 15N in Year 1, and differential soil disturbance was imposed after harvest. In Year 2, plant growth, N transfer from residue into the various sinks of the second crop (plant, soil, and residual residues), and changes in microbial activity and numbers were determined. Oat biomass was greater after lupine than after oat due to differences in supply of N from these residues. Buried residues of both crops appeared to decompose faster than when left on the soil surface. Lupine residues decomposed faster than oat residues. Oat biomass was not affected by soil disturbance if grown after lupine but decreased when oat straw was buried in the soil. More residue N was recovered from soil than from the crop. Most 15N was recovered from disturbed soil, which also had greater dehydrogenase activity and more culturable fungi. At the end of the oat–oat rotation, 20 and 5 kg N ha−1 were derived from the roots of the first crop in undisturbed or disturbed soil, respectively. Equivalent values for the lupine–oat rotation were 18 and 44 kg N ha−1. Returning aboveground residues provided an extra 52–80 kg N ha−1 for oat and 61–63 kg N ha−1 for lupine relative to treatments where they were removed. Over a year, lupine contributed 9 to 20 kg N ha−1 more to the agroecosystem than did oat. This study was funded by the Portuguese government and the European Union through project POCI/AGG/42616/2001 from the FCT with funds from FEDER. We thank Paula Gonçalves Silva and Madalena Quelhas for technical assistance. We thank the Instituto Nacional de Investigação Agrária e Pescas for the use of the Pegões Experimental Station.